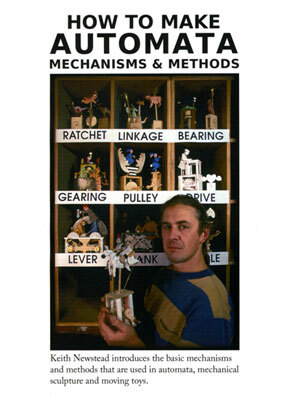 Learn with Keith Newstead the mechanisms and some of the methods involved in making automata. Running time: 42 minutes. Now available to download or rent on vimeo. This is the 21st anniversary digital edition! Previously available on VHS and DVD, for 2015 we have enhanced all the animations. Keith Newstead introduces the basic mechanisms and methods that are used in automata, mechanical sculpture and moving toys. Watch the trailer below or buy / rent here. How to Make Automata – Trailer from Cabaret Mechanical Theatre on Vimeo. Making automata is hard. It requires a wide range of construction skills and an understanding of certain mechanical and engineering principles. This can be very frustrating to the beginner but help is here now with this inspiring video which features the work of Keith Newstead. Part One covers: Levers, Cranks, Linkages, Cams, Shafts & Bearings, Ratchets, Gearing and Drives. The second part concentrates on some of the ways the mechanisms can be put together to make automata. Buy or rent here.